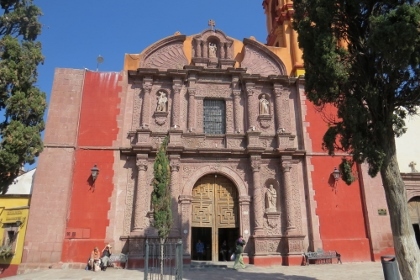 The Protective town of San Miguel and the Sanctuary of Jesús de Nazareno de Atotonilco represent the cultural exchange between European and Latin American cultures in a specific regional context. 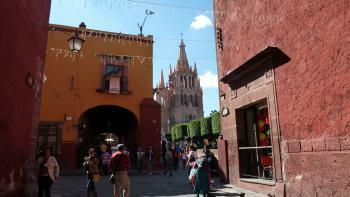 San Miguel de Allende is a historic town founded in 1542. It was an important stopover on the Antiguo Camino Real, part of the silver route from Zacatecas. The Sanctuary of Jesús de Nazareno de Atotonilco is a Jesuit sanctuary located 14 km from San Miguel. It is renowned for its Baroque art and architecture. I arrived at San Miguel by car, and left it at the parking lot of a row of megastores on the outside of the city center. Easy to park and free. I then took a collectivo into town, whose driver was clearly used to navigating the narrow cobblestone streets. These streets together with San Miguel's hillside location just gives it an edge beyond other Spanish-colonial cities. No wonder that American and Canadian "snowbirds" have found this place to seek shelter during the winter. I saw many of them sitting at the central square, reading a newspaper or doing a crossword puzzle. They were joined by several less fortunate looking indigenous people, selling trinkets or begging. I started with checking out the "Former Royal Hospital of San Juan de Dios", part of the Camino Real WHS. I then walked around the small town for an hour or 2 without seeing anything very remarkable. Had a good lunch though consisting of fish taco's. From San Miguel I drove the short stretch north to the Sanctuary in Atotonilico. It lies in a sleepy and dusty village, such a change from the vibrant Mexican cities I had seen so far. The sanctuary is right at the heart of town and can't be missed. It has a fairytale castle-like exterior (see large photo above). Inside it is fully covered with kind of crude religious drawings. It's a bit of a stretch to call this the "Sistine Chapel of Mexico": folk art such as in the wooden churches in Europe more came to my mind. The most ornate chapel is to the right when you leave. I was prepared to look for "the lady with the key" to open it for me for a tip, but noone was around. But you can look inside anyway through the iron raster. San Miguel was such a lovely place to spend a slow day, strolling along the grid of streets and poking our head into a large number of churches. Our first view as we drove into town was a pretty impressive introduction, from the viewpoint the rose pink church at the centre of town glowed in the orangey dusk. Our walk around town that evening revealed yet another Mexican city with a vibrant, family friendly atmosphere and a wealth of eating opportunities. The next day San Miguel revealed its photogenic charm to us. The clear blue skies contrasted with the bright primary colours of the buildings as we sat enjoying our take away breakfast on the central square. It was evident that there were a lot more English speaking visitors here as there is a large community of North American retirees here, whilst it did change the atmosphere a little you certainly couldn't argue with their choice of location. 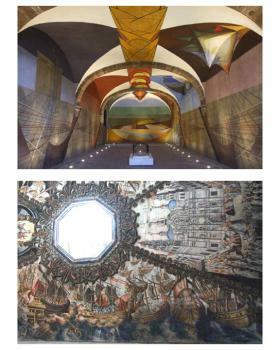 A tour of the cities churches proved worthwhile, and as Paul points out below the cultural centre provides a welcome delight with the uncompleted room covered in an abstract mural by Siqueiros. There was also a freshly painted mural at the Biblioteca, which has seems to be a bit of an expat cultural hub. Heading off we called into the art centre aimed mostly at wealthy expats before carrying on to Atotonilco. This was a worthwhile stop; the painted ceiling is pretty special telling an impressive artistic story that doesn't really need to be described by a comparison to Michelangelo. San Miguel and Atotonilco were very lovely places to visit, perhaps they are no more than just pleasant but they certainly are worthy of a visit if you are travelling through central Mexico. I visited San Miguel de Allende in Feb of 2010 as part of a photography workshop put on by two professional photographers from my home area. Every year they take a group to San Miguel. Shortly before I left I had occasion to speak with one of the students from a previous year; in parting he said “San Miguel will change your life”. I must admit I had to fight to keep a straight face thinking ‘a bit dramatic don’t you think?’ However after two weeks in the colonial town (heck, after my first morning) I was a believer; San Miguel is magic. While there is a large influx of North Americans, either temporarily or permanently, they don’t come close to outnumbering the locals whose warm welcomes and gracious attitudes are as much a part of San Miguel’s charms as are the narrow cobblestone streets and rooftop cafes. If the world was once black and white then colour was invented in San Miguel. From the warm yellow and orange walls draped with vibrant bougainvillea to the pink spires of La Parroquia to the many lively marketplaces, colour is everywhere in San Miguel. The only times I encountered anything close to a crowd was on Sundays when I joined the locals in La Jardín for a festival (a real highlight) and when I joined a hoard of visitors at La Biblioteca for their weekly home tour (something I would in the future avoid at all costs). Walking is the best way to explore but there is an abundance of taxis that will take you anywhere in the city for a mere 25 pesos. There are also several companies that offer a car service that can take you to any number of fascinating places all within an hour or less drive of San Miguel. There is the capitol city of Guanajuato and Pozos, a sort of ghost town of abandoned mines and haciendas that has undergone a resurgence as an artist community. 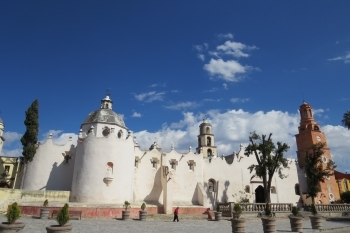 Of course a visit to San Miguel wouldn’t be complete without a visit to the beautiful El Santuario de Atotonilco. The day I made the trek we arrived early and waited for the church to open. We weren’t disappointed when at the appointed hour a little old nun slowly opened the massive wooden doors like she has no doubt done year after year. Don’t be fooled by the dirt road town or the nondescript exterior of the church, the inside is breathtaking. While this is the pièce de résistance of the area’s churches, San Miguel itself is full of gems well worth exploring and not just the obvious ones. Check out Templo de Santa Ana with its small quiet burial crypts unceremoniously tucked in next to the busy Biblioteca. All the churches are free of charge but rely on donations so always be sure to drop some pesos in the box before leaving. Eating is never a problem in San Miguel and water is either bottled or filtered; I ordered water by the glass with no worries. While there are many restaurant cuisines available don’t be afraid to by local in the marketplaces and be sure and visit some of the more traditional spots like Olé Olé on Loreto for aracherra or the ‘Blue Door’ bakery for a cream horn or other Mexican pastry delight. So if you want to experience the best of Mexico skip the resorts and consider experiencing the magic of San Miguel and like me, you will anxiously await the day you return. He visitado la pequeña ciudad de San Miguel de Allende en el estado de Guanajuato y es en verdad una ciudad hermosa, llena de un aire artístico, cultural y religioso, es una ciudad fascinante, la visité en enero de este año, y en verdad fue una experiencia muy agradable. Me parece muy acertado que se haya inscrito dentro de lista de ciudades parimonio de la humanidad, también tuve la oportunidad de viistar el Santuario de Jesús Nazareno en Atotonilco, lugar de gran tradición religiosa y artística, lamentablemente muy deteriorado por el tiempo que estuvo expuesta a los elementos, además para los mexicanos es una lugar de gran importancia por que fue un lugar clave en el desarrollo de la idependencia de nuestro país, de este lugar el Padre de la Patria Dn. Miguel Hidalgo y Costilla tomó el estandarte de Ntra. Señora de Guadalupe símbolo de la mexicanidad y emblema de nuestra raza. Por desgracia mucho del suelo de San Miguel de Allende, es ahora propiedad de los extranjeros, definitivamente debe haber leyes que prohiban la tenencia de la tierra a los extranjeros en un determinado porcentaje, pero en fin, para aquellos que tenemos la fortuna de sentirnos dueños de nuestro patrimonio, que lo conocemos, lo respetamos y lo cuidamos, San Miguel de Allende y el Santuario de Jesús Nazareno en Atotonilco, son verdaderamente PATRIMONIO CULTURAL DE LA HUMANIDAD. México tiene mucho más que mostrar al mundo, sólo esperen un poco más. I have already expressed my view that the Monarch Butterfly Forests should be a shoo-in for inscription in 2008 but I am not so adamant about Mexico’s second proposed site. It comprises 2 locations separated by around 15kms – we visited both in Mar 2008. The bigger is the town of San Miguel de Allende (SM). A few quotes from the town’s Web site should give you a pretty good idea of what it is like – “A shop-a-holic’s dream”, “a vibrant and lively community of artists, musicians and writers”, “one of Mexico’s top rated destinations year after year”, “Thousands of people come to SM every year to learn Spanish, study art or take Mexican cooking classes”, “If you are thinking of … retiring in SM you are probably interested in our SM real estate”, “The foreign community of SM consists of thousands of people from all over the world who have chosen to make this delightful and historic town in Central Mexico their home”. Some Mexicans we were speaking to in nearby Guanajuato joked that it was said that you needed a US visa to get in! Apparently it all started after WWII when US ex GIs found that their de-mob “education grants” went further south of the border! It is certainly very pleasant but, apart from its up-market ambiance, is it really in essence that different from many other “colonial” towns in Mexico (and there are a fair few on Mexico’s list already)or elsewhere in Latin America? Yet, to be fair, Europe is somewhat over represented on its towns also! SM is perhaps better preserved than many as its fabric has clearly benefited from the money available and many of the houses have been converted into restaurants, hotels and interior décor shops. My main memory of the place beyond the standard “colonial fare” was of the stunning unfinished Siqueiros mural from 1948 ("Vida y Obra de Ignacio Allende" - photo) in one of the rooms of the “Escuela de Bellas Artes” (Built 1775 and originally a nunnery but now full of American music, art and dance students). 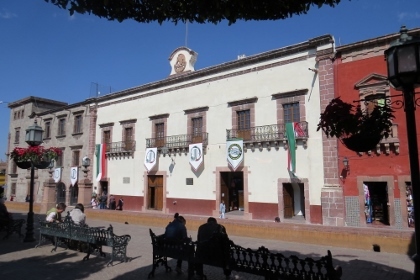 The second strand of this nomination is the Sanctuary of Atotonilco. Set in a quiet dusty village at the end of a dirt road this place gelled totally with my romantic “pictures” of old Mexico (which no doubt owe a lot to numerous Hollywood movies)! Dating back to the 18th century it also figures in the history of Mexican Independence as a place visited by Hidalgo. The exterior is undergoing significant renovation and the interior still needs some too (in 1996 the WMF put it on their list of the "100 most endangered monuments in the world") – but the murals are its star feature as they contain some wonderful early “primitif” (or "Folk Baroque") murals. Some depict Spanish galleons “bringing the word” (photo)and there is lots of blood and suffering depicted everywhere in what has been called (with more than a little hyperbole) "The Sistine Chapel of the Americas"!! We were there for a small service, which was nice, but I suspect the place is best seen at the time of a fiesta or major service – when the local indigenous people gather and celebrate. Again there are some 19 missions and 6 cathedrals on Mexico's inscribed list already so does it need another historic religious building? I wonder if it has been included to leaven SM with something a bit more "worthy"? And, as well as inscribing multiple sites (the existing 2 sets of Missions), Mexico does quite seem to like "pairing" them (viz Mexico City/Xochimolco, Oaxaca/Monte Alban and even Puebla/Cholula - though the latter got rejected by UNESCO). So,in conclusion, both are undoubtedly places worth visiting if you are in this area of Central Mexico, but whether they are of “World Class” is more debatable. I also have a slight feeling of distaste for the rampant commercialism of SM. Not in itself – every location has the right to utilize its assets to maximize its earnings but I suspect that gaining WHS status is a major strand in its tourism development strategy and UNESCO inscription shouldn’t be used significantly for that purpose. But it is the way WHS is going and explains why places are prepared to spend so much time and money gaining the right to show the logo. My cynicism will be compounded if this site gets inscribed in the same year in which the undoubtedly “world class”, with or without its bridge, Dresden is removed from the list. Equestrian Statues: The Plaza Civica in San Miguel de Allende contains a large statue of Ignacio Allende mounted on a horse. 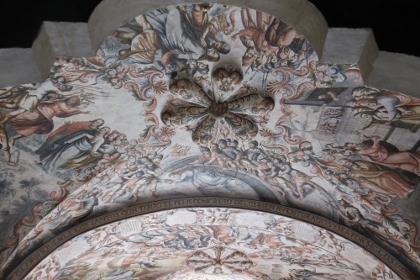 Frescoes or murals by famous painters: Siqueros mural in one of the rooms of the ?Escuela de Bellas Artes? Built in the 18th century: San Miguel was .."first established in the 16th century to protect the Royal Route inland,(and) reached its apogee in the 18th century when many of its outstanding religious and civic buildings were built in the style of the Mexican Baroque ...The urbanization of the Bajío was a phenomenon of the 18th century not repeated in other regions of New Spain ..Between 1730 and 1760 the power and control spaces of the village were moved from the ancient Soledad plaza to the plaza that had harboured the parish temple since the 16th century". The Sanctuary of Atoninalco was built in 18C. Dubbed as another WHS: The Sanctuary of Jesus de Nazareno de Atotonilco has been called "The Sistine Chapel of the Americas"